BRENTWOOD, Tenn. (February 5, 2018) – Local FFA chapters in search of funding for their next animal science lab, community garden or other noteworthy agricultural project, take note. Tractor Supply Company, the largest rural lifestyle retailer in the United States, will soon launch its third annual Grants for Growing campaign—a competitive grant program designed to support local FFA chapters across the country that want to make a difference in their communities through sustainable agriculture-focused projects. February 5, 2018 – Cattle producers Joan Ruskamp of Dodge, Nebraska, Chuck Coffey of Springer, Oklahoma, and Jared Brackett of Filer, Idaho, are the new leadership team for the Cattlemen’s Beef Promotion & Research Board (CBB), elected unanimously by fellow Beef Board members during the 2018 Cattle Industry Convention in Phoenix on February 2, 2018. Ruskamp will serve as chairman, Coffey will serve as vice chairman and Brackett as secretary/treasurer to lead the national Beef Checkoff Program for the coming year. Area producers, crop consultants and pesticide applicators are invited to participate in the Crop Protection and Nutrition Workshop sponsored by Colorado State University Extension, DowDuPont, Syngenta, Helena Chemical Company and Kugler Company. The workshop will be held at the Logan County CSU Extension Office in Sterling, 508 S. 10th Avenue on February 15 from 9:00 am to 4:00 pm. Colorado State University Extension specialists, field and technical sales agronomists from four chemical companies will present on fertilizers and insect, weed and disease control solutions that improve crop yield and quality. The meeting has been approved to offer Certified Crop Adviser Continuing Education Credit Units. This program is free of charge. Lunch and refreshments will be provided. Please RSVP by noon on February 14. For more information on the agenda and registration please contact Wilma Trujillo at 970 522-3200 or wilma.trujillo@colostate.edu. ARLINGTON, VA – The U.S. Dairy Export Council (USDEC) and the National Milk Producers Federation (NMPF) today urged the U.S. Senate to swiftly approve Gregg Doud as chief agricultural negotiator in the Office of the U.S. Trade Representative (USTR). Doud’s confirmation process was halted last year after Sen. Jeff Flake (R-AZ) placed a hold on his nomination. With Flake’s hold now lifted, USDEC President and CEO Tom Vilsack and NMPF President and CEO Jim Mulhern are asking the Senate to move quickly to confirm Doud, particularly given the breadth of trade issues in which the USTR is engaged. ST. LOUIS (February 5, 2018) — Conversations in the hallways and over lunch are an integral part of the educational experience at Commodity Classic as farmers share their knowledge, passion and insight with their colleagues from across the nation. The “most popular event under the Golden Dome” is set for March 22, as Gov. 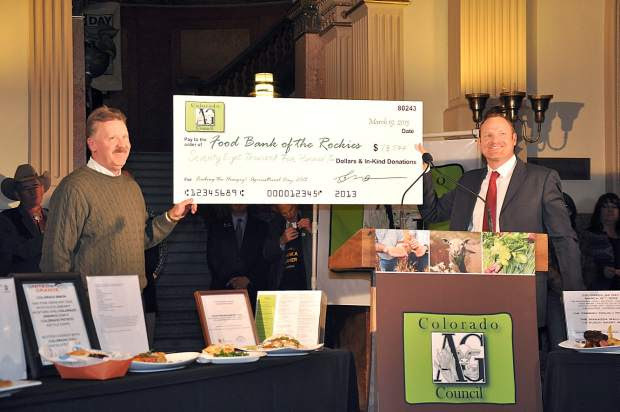 John Hickenlooper, state officials, the media and others will take part in a well-deserved “thank you” to Colorado’s farmers, ranchers and agribusinesses during Agriculture Day at the Capitol. RITZVILLE, WA, February 05, 2018 — Trade, the 2018 Farm Bill and crop insurance top the list of priorities leadership and staff of the Washington Association of Wheat Growers (WAWG) will focus on during their advocacy trip to Washington, D.C., this week. The wheat growers will be meeting with many of Washington state’s federal delegation, as well as several of the U.S. Department of Agriculture’s agencies and key leadership in the House and Administration. Jeff Flake, Senate Republican from Arizona, has lifted his hold on the nomination of Gregg Doud as chief agriculture negotiator. Flake had placed his hold on the President Trump nominee because he was upset about a Trump proposal in the North American Free Trade Agreement negotiations. The proposal would have allowed Florida tomato producers to use U.S. trade remedy laws to counter surges in Mexican produce imports. The Hagstrom Report says Flake had secured commitments on NAFTA-related trade priorities from the Office of the U.S. Trade Representative Robert Lighthizer and Senate Finance Committee Chair Orrin Hatch. Flake said Hatch is committed to working with him on NAFTA provisions that benefit all American producers. Lighthizer also committed to meet with Arizona stakeholders who rely on NAFTA and would have been hurt by the proposed provision. Flake says, “Given the importance of U.S. agriculture and what’s at stake for them in the NAFTA negotiations, I’m pleased this nomination can move forward.” Senate Ag Committee Chair Pat Roberts says he is pleased that assurances have been given and the path for Gregg Doud to be confirmed as the chief agriculture negotiator has finally been cleared. The U.S. District Court in Washington, D.C. issued a ruling that partially denied the U.S. Department of Agriculture’s motion to dismiss a lawsuit over the sale of “The Other White Meat” trademarks. The National Pork Producers Council sold “The Other White Meat” trademarks to the National Pork Board in 2006. NPPC President Ken Maschoff says they are conducting a thorough review of the decision and looking at all their options. “We are disappointed that the court partially denied the USDA motion to dismiss this frivolous lawsuit, one that was never based on a legitimate legal challenge to the sale.” He says the suit was brought by an anti-meat activist group intent on eliminating meat consumption and harming the beef industry that employs thousands of Americans and feeds billions around the world. Maschoff adds, “Regardless of the final outcome in this case, we are well positioned to continue fighting for the livelihood of farmers and others in rural America.” The USDA argued in court that the lawsuit, filed by the Humane Society of the U.S. and two other parties, lacked merit, was barred by the statute-of-limitations, and the plaintiffs failed to show how they were harmed by the sale of the trademarks from NPPC to the Pork Board. HSUS claims that the trademarks were sold for an inflated price. The U.S. Court of Appeals in Washington, D.C., granted the Environmental Protection Agency’s request to delay air emissions reporting requirements for farms until May first. Dairy Herd Dot Com says the ruling was issued late Thursday. EPA had requested more time to fine-tune the guidance on who must report and what must be reported. In April of last year, the D.C. Circuit Court had ruled that farmers were required to report air emissions of “hazardous substances” that exceeded certain thresholds set by two specific environmental laws. Attorneys involved in the case say it’s likely that Congress didn’t intend for the laws to apply to farmers. Livestock groups supported the EPA request for the delay while environmental groups and animal rights activists had been pushing the court to apply the requirements to farmers. Last April, the court had overturned EPA exemptions from air emissions reporting requirements that were issued to American farmers. The EPA asked the court for a delay in the requirements last October. Further complicating the issue is there is no scientifically accepted method for monitoring emissions requirements from livestock operations. A recent study by the University of California – Davis says farm fields are causing major nitrogen oxide pollution in the state. The study indicates that between 20 and 32 percent of that smog is caused by farm fields with fertilizer applications. The study says recent findings show that agriculture is one of the dominant sources of nitrogen oxide in the U.S. It says the impact is especially large in the Midwest, where fertilizer inputs are substantial. The study took place in California’s central valley, with the authors saying more study is needed around the state before new policies are suggested. If the study is proven, it means a lot of new regulations for farms around the state, with producers and agriculture industry stakeholders not happy about the idea. Renee Pinel of the Western Plant Health Association says it’s just one study that hasn’t even been peer-reviewed yet. A wide range of universities and regulatory agencies have studied this and not found agriculture to be a significant contributor of nitrogen oxide. Farm lending at commercial banks increased during the fourth quarter of last year. Demand for all types of loans, except for farm machinery and livestock, increased significantly over 2016. Operating expenses continue to make up the majority of loan originations. Loans for livestock made up over a quarter of all new non-real estate loans. The total value of operating and livestock loans increased almost 50 percent over the previous year, but they’re still below 2014 and 2015 levels. Large loans continue to make up the majority of farm loan volumes at commercial banks. Because of high production costs, loans of $100,000 or more continue to make up more than 70 percent of loan volume. After declining through 2016, the average size of farm loans grew in every quarter of 2017. Interest rates on all types of farm loans increased in the fourth quarter of last year. Total farm debt increased in the third quarter of 2017 from the previous year. The slight jump is due to both real estate and non-real estate debt. Delinquincy rates are still low for both real estate and non-real estate loans, staying near two percent in the third quarter of last year.